The fleet name Badgerline first appeared in early 1985. It was as a result of the split of the large Bristol Omnibus Company emanating from the 1980 Transport Act. It operated buses from the depots of Bristol Marlborough Street, Bath, Weston-super-Mare, Wells, Highbridge and Chippenham. 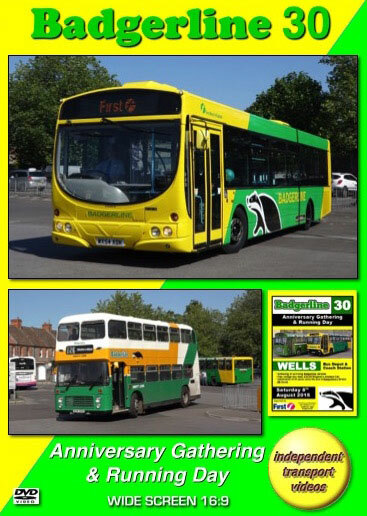 It was decided that the 30th anniversary of this momentous event should be marked by a small rally and running day based on the former Wells bus depot, now operated by Badgerline’s successor, Firstbus. To mark the occasion First West of England have painted one of their Volvo B7RLEs, number 66726 (WX54 XDK), in the 1991 version of the Badgerline livery. This bus will operate at former Badgerline depots over the coming months to show off its heritage. The event also marked the fact that it was 20 years since the last Badgerline Bristol RE buses were withdrawn from Wells depot on the 29th July 1995. Three Bristol REs were invited to mark this occasion. These were former Bristol Omnibus/Badgerline 1212 (YHY 592J) in NBC green with Badgerline decals added, 1257 (DAE 511K) in Bristol Omnibus green over cream livery, the style it carried as a heritage vehicle in the Badgerline fleet whilst running from Marlborough Street and Wells depots and former Provincial 12 (ECG 112K) a Bristol RELL6G that attended the final day back in 1995. The independent transport videos cameras were in attendance at the event to record the occasion. Our filming takes place at Wells coach station where the three special services operated from and also at the small bus depot where there was a display of preserved Badgerline liveried buses lined up for inspection by the public and enthusiasts. These buses included Bristol VRs, a Bristol RE, a Volvo B10M and a Ford Transit minibus in the ‘Mini Link’ livery. Also present was a Leyland Leopard coach in Badgerline coach livery. Our cameras take a ride to Street, Clarks Village onboard Bristol RE 1257 and return to the coach station on similar liveried Bristol LH6L, 353 (DHW 293K). We then ride on open-top Lodekka L8579 (869 NHT) (although not a Wells bus or even a Badgerline vehicle) and enjoy two superb rides through the countryside and the see the city of Wells from a grandstand position on this warm and sunny mid summer day! The Badgerline liveried Volvo B7RLE, 66726 is brought into the coach station for photographs, and is joined by some of the other preserved vehicles to complete the scene. All this is taking place as the current buses belonging to Firstbus and independent operator, Webberbus go about their daily duties. We then travel onboard Bristol RE 1257 to Nailsea for an overnight stay with Provincial 12, Badgerline 1212, and Volvo B10M, 101 (D101 GHY) also joins us. Our cameras then paid a brief visit to the Brislington bus rally that took place the following day to record the Badgerline buses in attendance. We conclude with a Photo Gallery of Badgerline buses in Bristol and Bath during their first full year of operation in 1986. We hope you enjoy the celebrations!